I watched live on Chinese feed. It's no surprise the mighty strong USA won. I enjoyed their strong difficult floor routines by Skinner and Biles. Yeah yeah I said Skinner :P. At least she woke me up because she does hard stuff that keeps me watching. I wonder what Ross's beam inquiry was about? Say what you want about Ross but she was the only one from USA that I liked on beam. I honestly do not understand how they scored so close to Chinese beam? My favourite part of team finals was China's beam, especially Huang Huidan's. Romania qualified 7th but came in 4th. I'm happy for them. They were so close to 3rd with 170.963 for 4th place. I saw Iordache on beam and she was on fire. She scored the highest on beam with 15.5! I'm looking forward to seeing Munteanu's beam. She also scored high with 15.2. Russia managed to take bronze. I saw Spiridonova and Mustafina on bars and they did good job. I only saw Mustafina on beam and floor she had some mistakes but she handled everything well. They fought to stick their vaults. I only saw Nabieva and Mustafina on vault. They did a really good job. They really needed those scores. They are fighters. Not everything went well for China, Russia and Romania but they shouldn't be so hard on themselves. 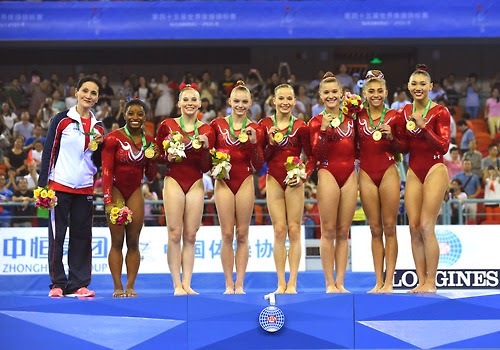 They are good teams they just need to hit hit hit their routines and maybe they can put pressure on team USA. They need more difficulty too but it's still mid quad. I think China, Russia and Romania knows what they need to do to improve for Rio. I hope they achieve what they intend to improve on. USA is too strong and of course they know they can't get lazy and expect to think they will always win easily. Congratulations to all the teams.